Based in the Pacific Northwest, we are the oldest family owned architectural hardware company in North America. We have been committed to helping you enhance the beauty and security of your home for over 130 years. Our goal is to inspire you, and we have an experienced staff to help you create the home of your dreams. Door hardware and plumbing fixtures require expertise not found at the local hardware retailer or "big box" chain stores. Chown employees are specialists in these products and participate in continuing education to ensure complete satisfaction. We are dedicated to providing the finest products at great prices while maintaining the highest level of customer service in the industry. Our cabinets are furniture quality products made by master craftsman. We utilize years of experience based on old world craftsmanship and the latest innovative practices. Each project is manufactured to meet individual specifications. Designs are executed with the ultimate goal of balanced forms and functions. AFC has extensive experience with traditional hardwoods such as Cherry, Ash, Walnut and Oak. However after years of extensive research on materials, technologies and modern adhesives, plus our own experiments based on our experience and Chemistry background (MS in Chemistry), we discovered very efficient ways to create custom cabinets out of rare exotic figured woods for costs competitive to regular hardwoods such as cherry or maple. Some of these species such as the highly figured makore are so rare, they may enter the world market with the availability of only a few logs per year. We offer over 30 different wood species from our own inventory and more species are available from our suppliers. Since veneering is several times more materials efficient than traditional lumber, it allows us to use truly unique wood species for prices very competitive to those of traditional lumber materials while delivering excellent results and preserving our Natural Resources. Due to modern technology in adhesives, and substrates, the mechanical properties of the veneered products often exceed the properties of solid wood. These products are primarily used on custom yachts, musical instruments, high end custom furniture pieces and architectural woodworks. AFC has nothing to do with cheap veneer substitutes from mass production manufactures. Our introductory prices for these products are very competitive to what most competitors charge for quality cabinets made out of ordinary hardwoods such as cherry or maple, Please contact us for free estimates, free professional custom designs, expert advice or if you have any questions regarding our products or services. 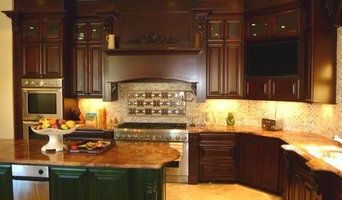 Parr has been providing cabinets and appliances to the building industry for more than 20 years. In addition to finding quality cabinets for your project, you'll find a great selection of countertops, hardware and appliances too. Huggy Bear's Cupboard's fine cabinetry is sold all over the United States. In the Portland metropolitan area, our customers are fortunate to be able to visit our factory direct showroom, where all of our handcrafted cabinets are made to order. We are a plumbing wholesale company located in downtown Portland, OR. We have over 2000 Sq ft of plumbing products on display in our newly remodeled showroom. With working toilets, shower heads and a large variety of products from most major plumbing manufacturers. North Pacific Supply Company, Inc.
With the latest name-brand kitchen appliances and stylish kitchen cabinets and countertops, North Pacific Supply Company is the Pacific Northwest's premium supplier for professional kitchen remodeling and renovations at affordable prices. Our experienced kitchen designers help you each step of the way, including design, planning, and installation. Featuring 25 stunning full kitchen displays for customers to browse and touch, North Pacific Supply Company offers appliances from 16 premium manufacturers. Shop the newest energy efficient refrigerators, ranges, venting solutions, dishwashers, microwaves, washers and dryers with the hottest features from quality brands such as Electrolux, General Electric, GE Profile, KitchenAid, Whirlpool, Jenn-Air, Maytag, Samsung, and Frigidaire. North Pacific Supply carries beautiful kitchen cabinetry styles and fashions — from modern to traditional, and cottage to craftsman — in every finish and hardware option imaginable. Complete your kitchen with countertops in granite, quartz (stone), solid surface and laminate. Serving Portland, Bend and Medford in Oregon, and Vancouver and Southwest Washington. Builders and designers source for great service & advice, door & cabinet hardware, woodworking machinery, plumbing and more! Established for over 75 years, we are locally owned and centrally located in Portland, OR. Here at Culver Glass we pride ourselves on being the best in the business. No matter the job, we strive to exceed our customers expectations by providing the highest quality work. We have been locally owned and operated in the Portland metro area since 1930. Every customer recieves the highest quality materials and workmanship no matter the project size. With locations in Portland, Salem and Eugene we are able to provide our service in your area. We understand that each of our customers have their own unique needs, whether it be residential or commercial services. We are dedicated to make sure each job has a personal touch, by providing free custom estimates to make sure the job is done right. Our staff is well trained to assist you. Kitchen and Bath Remodeling specializing in Tile and Stone work. 32-year old Custom Cabinet manufacturer based in Washington State providing high quality German engineered frameless cabinetry for all designs and project levels. Hertco Kitchens has an extensive range of products with competitive prices that will satisfy virtually any requirement for your inspired kitchen project. Residential cabinet design and project consolation. We also provide innovative software solutions for the cabinet industry. Continental Hardware has been designing and manufacturing decorative hardware since 1969. Use the Houzz Professionals listings to find Tigard, OR kitchen and bath accessory vendors. Don’t rule out asking a kitchen manufacturer’s design team for help, too. Skills often can be overlapped to save you time and money! Here are some related professionals and vendors to complement the work of kitchen & bath fixtures: Kitchen & Bath Designers, Kitchen & Bath Remodelers, Interior Designers & Decorators, Cabinets & Cabinetry. Find kitchen and bath fixtures and accessories, plus installation experts, on Houzz. Check out Oregon kitchen products and installers, and bath plumbing products and installers, on Houzz. You can also look through project photos provided by Tigard, OR renovators, retailers and designers.